Two weeks ago on my way to work I was feeling pretty worn out and in need of a boost. I suddenly had a flash of me enjoying an ice cold Starbucks Mocha latte. I decided ever so joyously to pull into the local food mart and drag myself to the cooler section only to find they were sold out of my precious smooth icy creamy Starbucks!!! 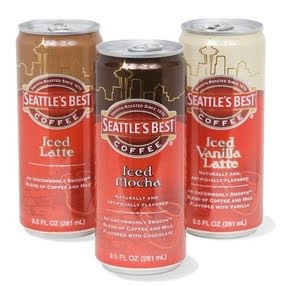 Well in a moment of shear weakness, potential regret and brand disloyalty I decided to grab a can (not a curvy clear beautiful glass bottle like My Starbucks) of the more moderately priced Seattle’s Best Iced Mocha. I was running out of time and just trying to hurry along and pay so I could get to work. In the elevator on the way up with only 5 minutes to spare I decided to crack into this Mysterious red can of potential awfulness only to discover with the very first sip that it is the best (hands down) iced mocha from a fridge that I have ever had! The first thing you notice is the chocolate. Its right at the forefront just begging you to keep going, to roll it around on your tongue and look for the other flavorful gems it caresses. The creaminess’ and the hint of that seemingly freshly brewed coffee come next. It’s almost like a milk chocolate bonbon with a layer of chilly cream surrounding a center of decadent whole bean coffee! So in my moment of desperation I discovered that I may not be as loyal to Starbucks as I thought. In fact depending on where you buy this magnificent beverage you can almost afford two for the price of one Starbucks! I did try the Iced vanilla Latte the other day and didn’t enjoy it, but if you’re in the mood for Mocha I can’t recommend this enough.